Some words in English are just difficult! I want to help you better understand difficult words in English, so I created this podcast called “Tough Word Tuesday.” The word tough in English is a synonym for something that is difficult. For example, if hearing the difference between two similar sounding words is difficult for you, then you could say the words are “tough to understand.” Well, now that you know the reason for the title “Tough Word Tuesday”, let’s take a look at the words. 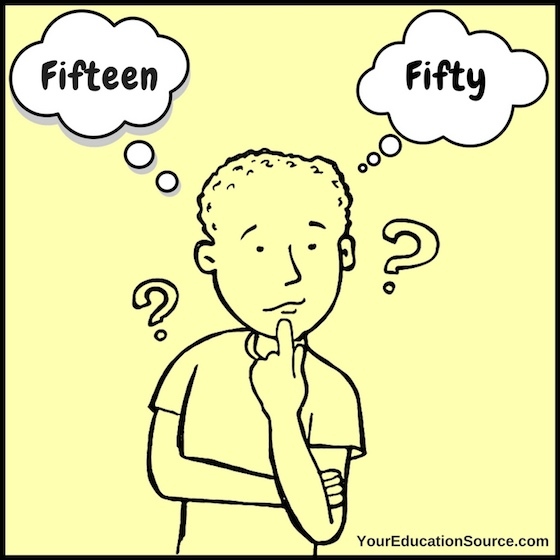 Two words in English that are often confused are fifteen and fifty. The are both numbers, fifteen = 15 and fifty = 50. What makes these two words tough to understand is they sound same except, the end sound of the words are different. Fifteen has an /n/ sound at the end of the word and fifty does not. So when you listen to the podcast (at the bottom of this post) focus your listening on the endings of the words. In the podcast I use two example sentences so that you can hear the words in use. The sentences are: “I leave for work at 9:15.” and “I arrive at 9:50.” My advice is that you listen to this podcast a few times, if you can’t hear the difference between the words fifteen and fifty. I also recommend that you say the words in order to improve your pronunciation, and this might help you to notice the sound difference at the end of the words. What are some other words that are “tough” for you in English? Leave a comment and let me know! ¡Algunas palabras en inglés son difíciles! Quiero ayudarte a entender mejor palabras difíciles en inglés, así que creé este podcast llamado “Tough Word Tuesday.” La palabra tough en inglés es un sinónimo de algo que es difícil. Por ejemplo, si oír la diferencia entre dos palabras que suenan similares es difícil para ti, entonces podrías decir que las palabras son “tough de entender.” Bueno, ahora que sabes la razón del título “Tough Word Tuesday”, echemos un vistazo a las palabras. Dos palabras en inglés que a menudo se confunden son quince (fifteen) y cincuenta (fifty.) Los dos son números, fifteen = 15 y fifty = 50. Lo que hace que estas dos palabras sean difíciles de entender son las mismas, salvo que el sonido final de las palabras es diferente. Fifteen tiene un /n/ sonido al final de la palabra y fifty no. Así que cuando escucha el podcast (en la parte inferior de este post) enfoca tu escucha en el final de las palabras. En el podcast utilizo dos oraciones de ejemplo para que puedas oír las palabras en uso. Las oraciones son: “Salgo para trabajar a las 9:15.” y “Llego a las 9:50.” Mi consejo es que escuches este podcast varias veces, si no puedes escuchar la diferencia entre las palabras fifteen y fifty. También recomiendo que te digas las palabras para mejorar tu pronunciación, y esto podría ayudarte a notar la diferencia de sonido al final de las palabras. ¿Cuáles son algunas otras palabras que son “tough” para ti en inglés? ¡Déjame un comentario y avísame!